A voyage he will never forget! 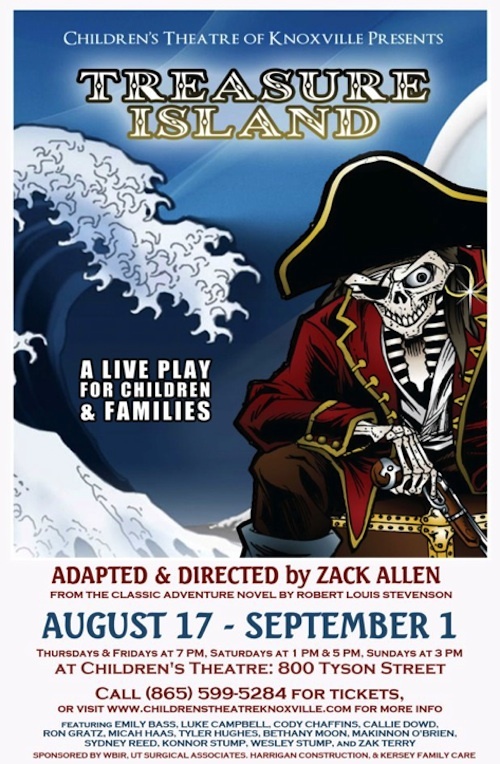 Cody is finishing up his last two performances of “Treasure Island” today at Children’s Theatre of Knoxville. It’s bittersweet. He has worked so hard on his role of Jim Hawkins. He spent the entire last 3 weeks of his summer vacation memorizing lines, blocking, characterization, and all the things that bringing a play to life entails. He loves his cast mates. 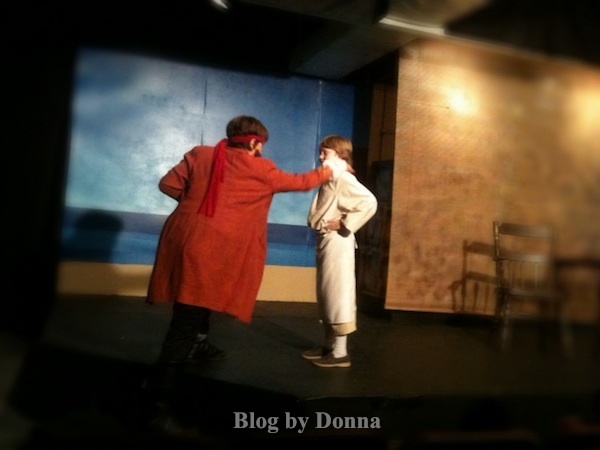 What can I say about “theater” kids?… they are a unique and incredibly creative and smart group. And funny. Oh. So. Funny. Most importantly, protective of each other. They look after each other in a way I’ve never seen in any other groups of kids. So Cody will miss this play. He will miss the camaraderie. He will miss being Jim Hawkins. I am so proud of you Cody, and how you made this character your own. I could watch you on stage in “Treasure Island” every night for the rest of my life and never get tired of it. Although we say goodbye to “Treasure Island”, I’m certain we will see these fantastic kids in many more adventures. Treasure island to this day is one of my favorite books! It is a great book! And this play adaptation was wonderful! That is great that Cody was part of this play! Yes, Stefani, it will leave him with such fond memories, for sure! What a great summer activity! It sounds like he had a wonderful time. Although it was a lot of hard work, it was his best summer, yet! huggs and congratulations to your son. I had a friend who once went out for the part of Mrs. Minchin in Annie. She didnt get the part, her dog however, got the part of sandy. Boy I tell ya he got such a kick out of being a stage hound. and was right depressed when the play ended. What a wonderful story, Adrienne! She must of been so thrilled to have her dog cast as Sandy! Aww — I would be SO proud!!!! You must be very proud!! Something he will remember forever! I loved the time i spent in theater! Congrats Cody and to many, many more! Yolonda, thank you… and I hope so. He does love it! That is so awesome! Congrats Cody! Congratulations. You are so right about theatre folk. I am still friends with the people I did plays with back when I was just a little older than Cody and dinosaurs roamed the earth. It’s not only a wonderful creative experience, but acting skills will help him in his adult life (business) even if he doesn’t pursue it as a career. How fun! I’m sure he’s forging lifelong bonds. I’ve pleaded with Jake to join a club, any club, including theater, but he’s just not having it. Congrats to your son! And you must be one proud mama. You must be so proud how amazing for the both of you. I can imagine how tough it will be when it is over, it is hard to break away from a group when you are so close like that. What a special son you have!! Ah, he’ll remember this summer for a lifetime! This is so wonderful that he was able to be a part of that. So very, very cool. I’m sure he’ll a part of productions in the future too, right? He will always rememeber this! How cool! I would be so proud too! What a memorable experience for him. I’d be proud too, way to go! omg that is so awesome congrats! How fun for him! I used to love acting in high school and college. I wish I had followed up with it. I hope he gets lots of opportunities to act 🙂 Good luck to him! I had the best summer growing up when my sister and I worked on a community production of My Fair Lady. Aww! Looks like he had fun! Wow, talk about an amazing summer!! I bet he will want to do this every summer now!